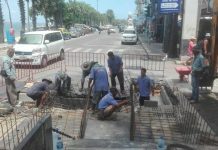 South Pattaya residents are calling on city hall to fix worsening problems with South Road. About 300 meters of the busy thoroughfare between Friendship Supermarket and the Tukcom electronics mall have all but collapsed, with multiple holes, sunken pavement and other subsidence problems. The rocky roadway has made for risky conditions, especially for motorbike drivers. Locals even erected a sign warning drivers to reduce speed due to the dangerous conditions, but even that has had to be moved due to pavement problems. Local business owners and residents say city hall needs to do something about the problem before someone is seriously hurt or killed. 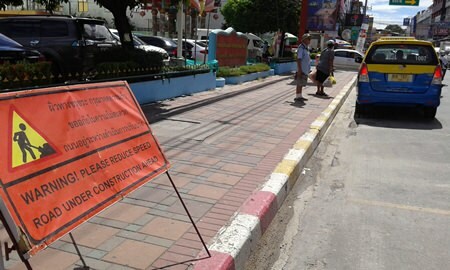 The condition of the road in front of Friendship Supermarket is worsening.